Cyprus Property Blog by Cleo : New on the market - Impressive Property in Peyia with Sea Views - NOW SOLD! • 228 sq. 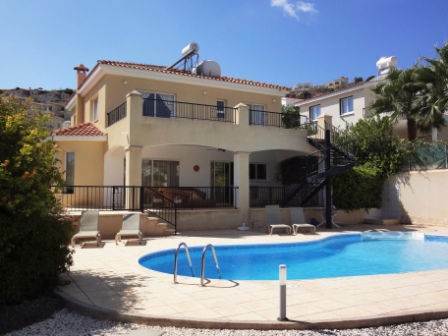 m., 4 bath, 3 bdrm 2 story - €450,000 EUR - Sea Views - NOW SOLD! Peyia, Paphos - This spacious and beautifully presented villa is located in the village of Peyia which has a wide range of local amenities, such as supermarket, post office, shops and restaurants. Coral Bay and the scenic Akamas peninsula, are a few minute’s drive away. There is a gated driveway with steps down to a pathway leading through the front garden to a covered entrance porch. The front door opens into a huge open plan living area, nicely separated into a lounge and dining area with an attractive fireplace. An archway leads to a well equipped kitchen and breakfast room with plenty of cupboard and worktop space. A separate utility room houses the washing machine and dryer, and there is a guest cloakroom off the living area. The staircase leading up to the bedrooms has plenty of natural light having tall feature windows. All bedrooms are double size and have fitted wardrobes and en-suite shower rooms, including vanity units. The master bedroom also boasts a wonderful jacuzzi bath from where you can lie back and chill, whilst at the same time enjoy the wonderful sea views. The master and 2nd bedroom have patio doors leading to a spacious terrace w/ fantastic sea and mountain views. This is a great place to relax and watch the sun set. Steps lead down from here to the ground floor terrace, also accessed directly from the kitchen and from the lounge. Again here there is plenty of space for outdoor dining and relaxing, and enjoying the view of the surrounding mountains. Steps lead from the terrace down to the lovely gardens and swimming pool, which has roman steps for easy access. A pool shower is on one side, and a gate for child safety. The landscaped gardens are mature with lots of shrubs and trees, and are designed to be low maintenance, with graveled areas and automatic irrigation. A corner patio provides a decorative feature. For those looking for a property with both privacy and sea views, this is it!